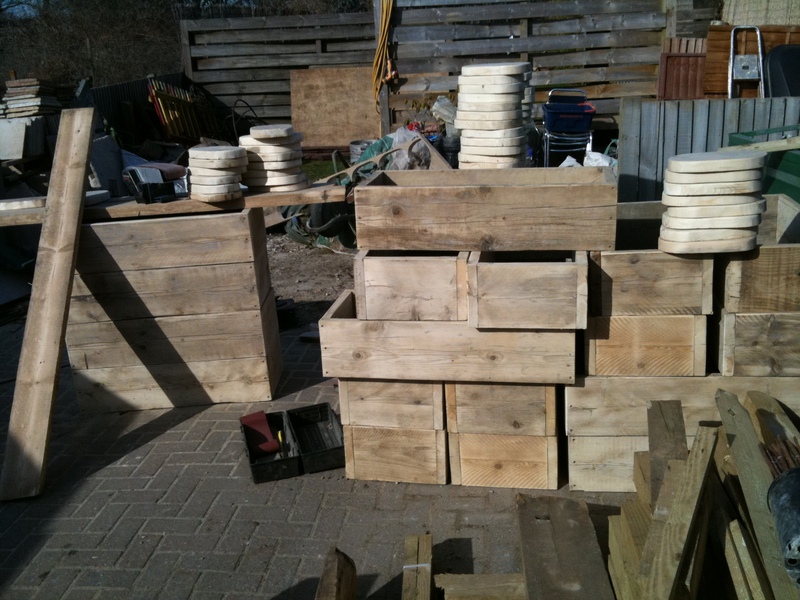 We were lucky enough to have a spell of good weather in March (2010) and were able to get cracking on a project to build a really funky planter for a local school. 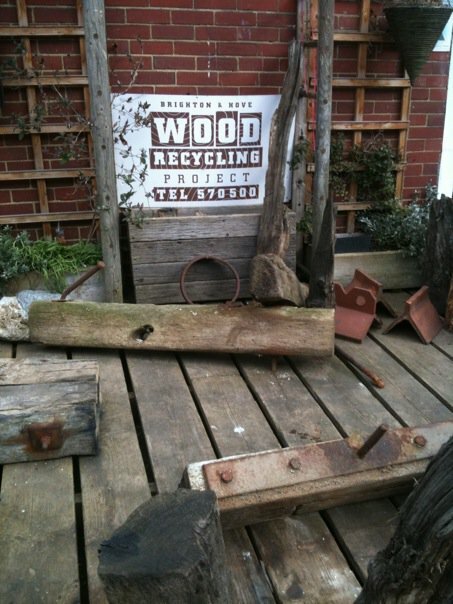 The brief was to use only recycled timber in the construction, so we headed down to the Wood Recycling Project in Brighton and managed to secure some unusual and interesting pieces of wood to use. The obvious candidates were reclaimed scaffolding boards as they are reasonably strong and there were loads for the team to choose from. 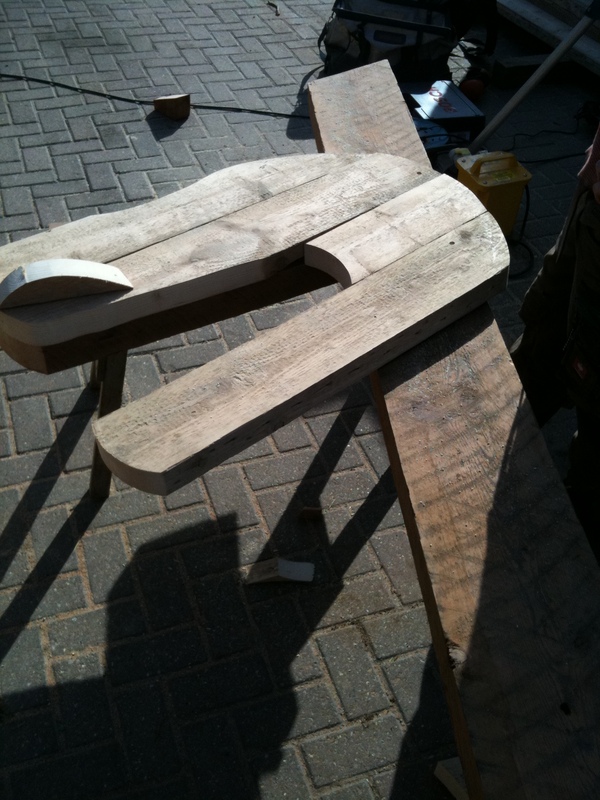 Once we had found what we were after we then had the unenviable task of removing all the nails and metal from each board. Oh joy! The guys were like a pack of mongooses (mongeese?) going busily over the piles of timber looking for bits that fitted the bill. 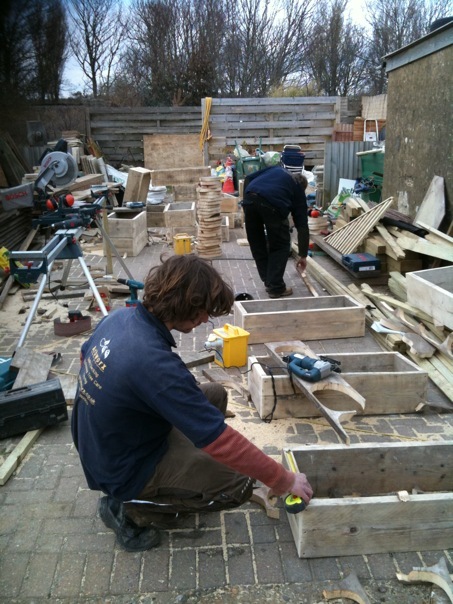 We got all the wood back to the yard and carried out a preliminary survey to see what would go where, and then the planter boxes began to take shape… whilst they were a straightforward construction of scaffolding boards which had to be sanded down and fixed together with strong decking screws, the drawback was that we needed to make around 30 of them! 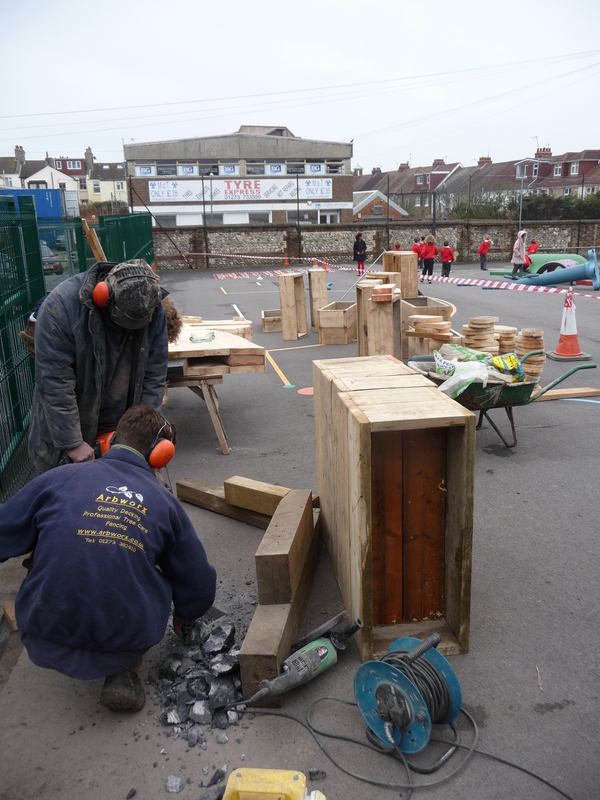 Sawdust rained down as each of the guys took on a separate element of the works and allowed their creative juices to flow. 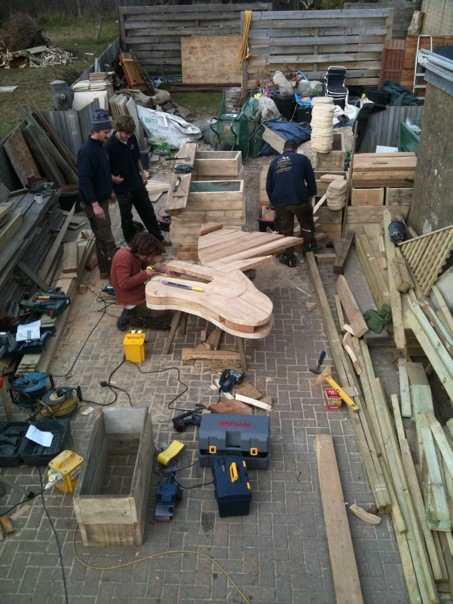 Richard was beavering away working out how the planters would relate in size to the sea serpent’s head, and Willy was concentrating on whether the whole thing would actually stand up. 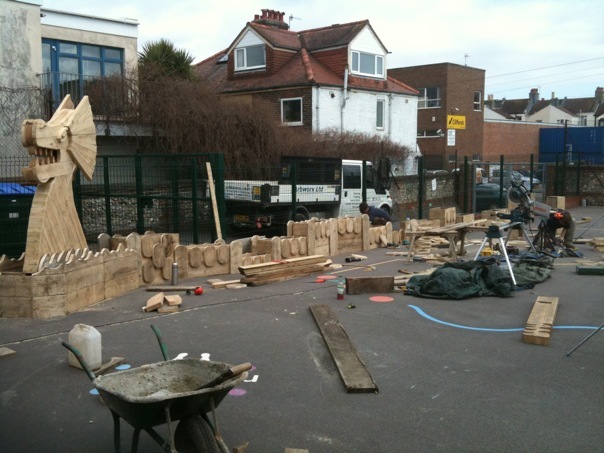 I had to step in when the whole project began to evolve into a major design and build for the whole of Sussex rather than just one school! As the build stage came to an end I had to review the delivery and assembly issues so that in the next couple of days we would be able to deliver the project in time for the Easter break. At this point I had to work out with the school authorities just how much bigger and longer they wanted the structure to be and go through with them how the timber preservative needed to be applied. Personally I preferred the planter when it was just the raw timber but it needed to last and without any form of treatment the wood would have rotted within just a few years. The preservative solved the problem of the fact that the planters would be holding wet soil and the constant contact with moisture would have been bad for the structure. Doesn’t look like much to start with! We installed the final sections at the end of the week and then had to mount all the finishing details. It was great to watch the kids’ faces at break time as they were all looking very intrigued. “What is it? 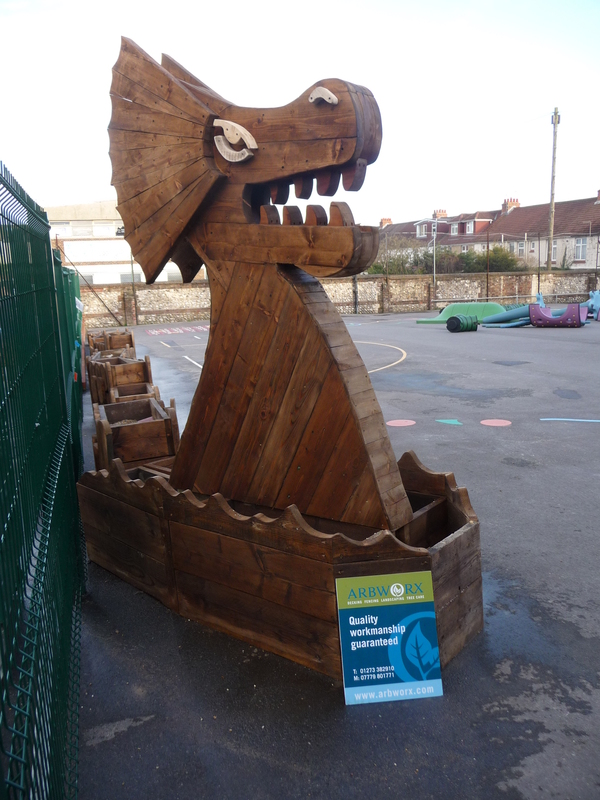 What you doing?” came from behind the safety barriers… all good feedback for us as we worked on to complete the installation and, lo and behold, the Viking Sea Serpent finally reared his majestic head to look over his new home in the school playground. Eventually all that was left was to fill the planters with soil and plant out the beds. 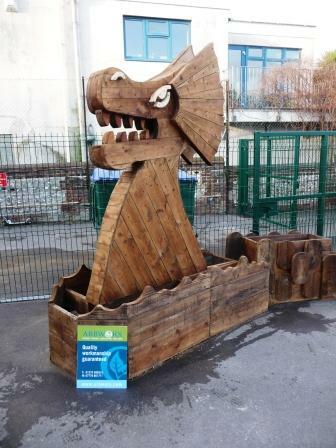 The Viking Sea Serpent planter in the final stages of installation : We loved this unusual commission from a local school to design, build and install a very special planter using reclaimed timber for their playground.